"Milly turned her head for an instant and looked out over the audience. The sensitive eye of the television camera picked up a curious trembling about her lips, and then, twice, blinding shafts of light splintered from her cheeks like tiny exploding diamonds." 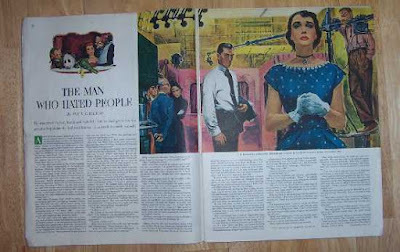 The Man Who Hated People is a short story by Paul Gallico. It is the story which the 1953 American film Lili is based on. The story was first published in the Saturday Evening Post, and it was later expanded into a novella called Love of Seven Dolls. "He was cruel to her, harsh and spiteful. Yet he had given her the greatest happiness she had ever known - in a world he made himself." Milly is a young girl and one of the cast of the popular television show, viewed and love by people of all ages. It also happens to be a puppet show, and Milly is the only human star, working along with six glove puppets. Crake Villeridge is a slightly abusive, misanthropic man and the creator of the show. The story starts as Milly makes her final, farewell appearance on the show. She feels horrible about it. Milly loves the puppets and the fantastic world of the show. But that isn't the real reason why she can't bear the thought of leaving what seems to be the "Never-never-land of the mind". The story isn't amazing, I suppose it could have been better - but it is pretty wonderful the way it is. I haven't seen Lili. Nor have I read Love of Seven Dolls (I would like to read it though). Both the novella and the movie might just be better than this short story, but it has a wonderful effect on you. I loved how you become a part of the story and begin to know and judge the characters in so few pages! I think, whatever the story loses in terms of plot, it gains it in the language and the flow. The story is beautifully written and worth a read. I liked Paul Gallico's books related to cats, and I do have a soft spot for all cat-loving-authors (like Diana Wynne Jones or Terry Pratchett). But I think with books like these, he might become one of my favourite authors! Short Stories on Wednesday (let's make that Thursday for this week!!) is a meme hosted at Risa's Bread Crumb Reads. You can read the story here! Nice review, Priya! I haven't read any Paul Gallico book yet, but one of my friends has recommended his book 'Thomasina' and I want to read that very much. This short story of his looks quite interesting from your review. Sounds interesting. I have heard of Lili but haven't seen it and I haven't read anything by Paul Gallico either. I guess I'll start with this short story. Risa - The story has a similar plot; it is kind of eerie, but no really sad. Like I said, it's not that great when it comes to the story, but the way it is written is nice! Can't say much about the film, but you should give Gallico a try! Never mind the typos, I hardly look at the keyboard when I type, anyway! CHE - He's a good author, though I am not sure how you'll find this story when you haven't read anything else by him! Then again, it's very short, so worth a try!! Thanks for stopping by! Lili is on my list of movies to watch - I also didn't know it was based on a short story (and I hadn't heard of the author until now). Thanks for pointing him out to me. HKatz - Hey, thanks for stopping by! Ah, me too; it's becoming my favourite meme! I don't think Paul Gallico is such a famous author; but that is unfair, if anything. His writing is great, you should definitely read his books!